“Practical science” has been widely used in the curriculum, exam board specifications and research traditions in science education for several decades in England. The terminology typically refers to a range of experimental and investigative activities conducted as part of science education in schools and colleges. According to major reviews of research literature, there is evidence that the assessment regime has had a major impact on practical work that teachers carry out. However, there is growing concern that the amount and quality of practical work carried out in schools suffer as a result of the impact of the high-stakes national tests. 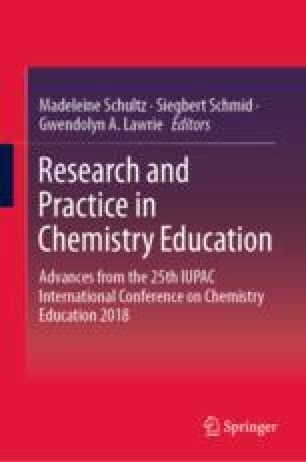 The chapter aims to investigate the underlying scientific methods that are promoted in the chemistry examination papers thus facilitating understanding of what is likely to be taught in chemistry lessons. In order to identify the types of scientific methods included in the chemistry examination papers, a framework was used focusing on four categories: manipulative hypothesis testing, non-manipulative hypothesis testing, manipulative parameter measurement and non-manipulative parameter measurement. The examination items from two examination papers of a leading examination board are classified according to these categories, and patterns on the marking are traced. The results indicate that for both papers, non-manipulative parameter measurement was the method assessed at a higher percentage. In both papers, manipulative hypothesis testing was the category with the lowest percentage of items or questions. Furthermore, the mark allocation was the highest in both papers in the non-manipulative parameter measurement category. The results indicate that there is consistency between the items allocated to each category of scientific methods, and the marks allocated to them, although in one paper there were more marks allocated to manipulative parameter measurement even though the relative frequency of this category was the lowest in the items. This observation may reflect an assumption that manipulative parameter measurement is considered to be cognitively more demanding and thus deserving of more marks. Some implications for assessment of practical chemistry are discussed. The study reported in this paper was conducted in the context of Project Calibrate based at University of Oxford. The authors acknowledge the funding support from the Wellcome Trust (grant number 209659/Z/17/Z). AQA. (2016). GCSE combined science: Synergy. Available at https://filestore.aqa.org.uk/resources/science/specifications/AQA-8465-SP-2016.PDF. Accessed 26 Feb 2019. Ofqual. (2015, July). GCSE subject level conditions and requirements for single science (Biology, Chemistry, Physics). https://assets.publishing.service.gov.uk/government/uploads/system/uploads/attachment_data/file/600867/gcse-subject-level-conditions-and-requirements-for-single-science.pdf. Accessed December 2018. Qualifications and Curriculum Authority (QCA). (2007). Science: Programme of study for key stage 3 and attainment targets. Archived version https://webarchive.nationalarchives.gov.uk/20080610180700/, http://curriculum.qca.org.uk/key-stages-3-and-4/subjects/science/keystage3/index.aspx.